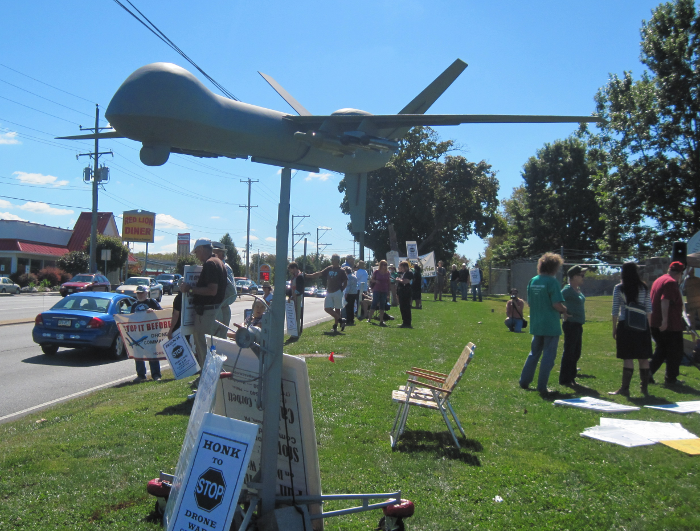 So with the initiation of the drone command center at the Horsham Air Base slated for October 1st, does that mean that this was the final protest against the center? No, because the center will take another year to fully install. So no, for the indefinite future, the protest will contniue. 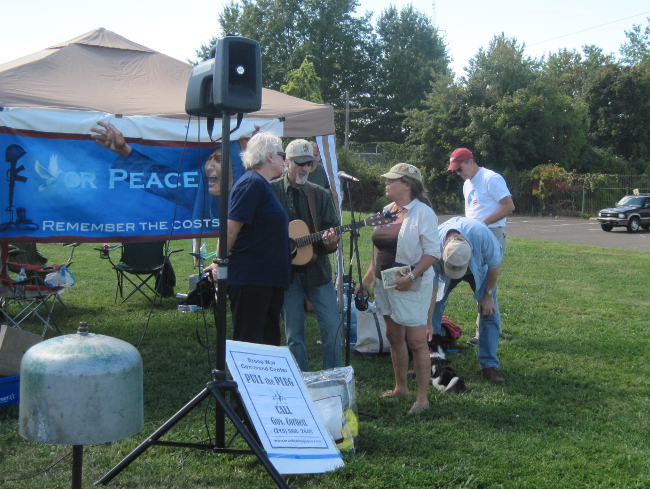 Robert Smith of the Brandywine Peace Community makes a point. How effective are drone strikes at reducing the combat effectiveness of US enemies? Not very, apparently. U.S. drone strikes carried out in Pakistan appear to have little impact on insurgent violence in neighboring Afghanistan, according to a new meta-study published by the Strategic Studies Institute of the U.S. Army War College. To be fair, they also cause less collateral damage than other forms of striking at targets. The Rev. 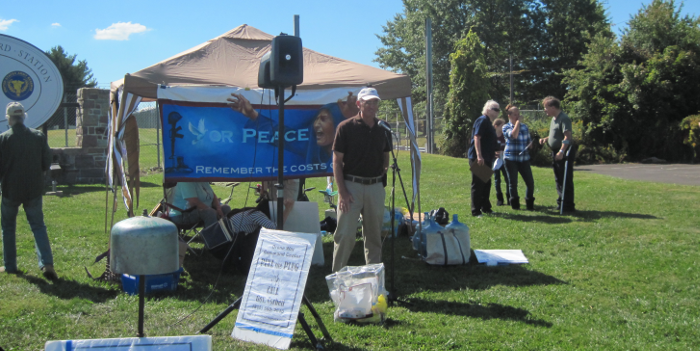 Robert Moore of the Princeton NJ Coalition For Peace Action (CFPA) makes other points. 7% of British drone sorties between 2008 and 2011 resulted in a strike, compared to just over 2% of US missions. The MoD data shows that in 2012 drone missions were even more likely to lead to strikes – 10% of sorties led to missiles being fired, compared to 5% in 2008. 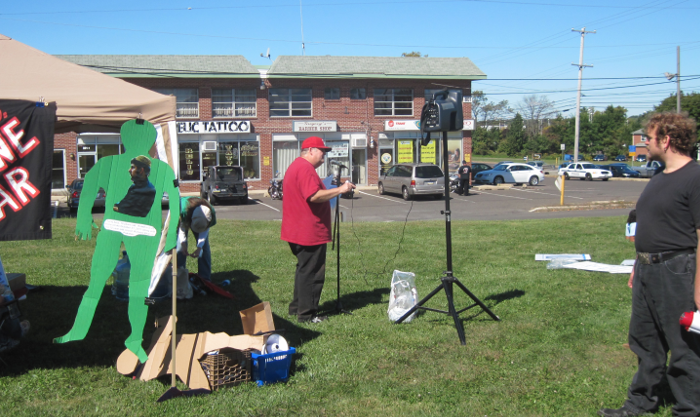 Our singer, Tom Mullian, keeps things light with a few songs. Obama's aggressive use of drones is a tacit acknowledgement that Americans have grown tired of endless war and military casualties. On February 4, 2002, the first killer-drone strike occurred in Afghanistan. Since then there have been approximately 423 similar attacks, 52 authorized by George W. Bush and the balance by Obama. Both presidents used the same legal justification, Congress' 2001 Authorization for Use of Military Force as well as the international law regarding nations' right to self-defense. The killer-drone strikes have occurred in six countries that we know of: Afghanistan, Iraq, Libya, Pakistan, Somalia and Yemen. The bulk of the strikes, and deaths, have occurred in Pakistan's Northwest Frontier Province or the adjacent area of Afghanistan, an area known to house both al Qaeda and Taliban leaders. 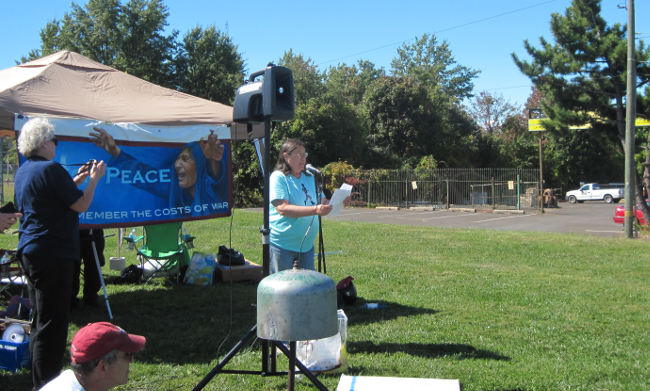 A member of Brandywine calls out names of the dead from drone strikes. Fortunately, after the war scare of early September, Syria has agreed to allow inspections and destruction of their chemical arsenal. The five permanent members of the deeply divided U.N. Security Council reached agreement Thursday on a resolution to eliminate Syria’s chemical weapons. A vote depends on how soon the Organization for the Prohibition of Chemical Weapons, which is to meet Friday evening at its headquarters in The Hague, can adopt its plan for securing and destroying Syria’s stockpile. And in even better news, the US and Iran appear to be heading for agreement for the first time since the Iranian Revolution of 1979. The US-Iran meeting in New York represented the highest-level direct contact between the countries in six years. Diplomats from the P5+1 were also present. Mr Kerry said he was pleased that Mr Zarif "put possibilities on the table", but said a lot of work remained to be done and that Iran would have to answer questions about its nuclear programme.